According to industry sources, the airline is set to operate only five departures from Mumbai, one from Bengaluru and about 20 from Delhi on Friday. Cash-strapped Jet Airways has suspended a number of flights, including to most foreign destinations such as Amsterdam, London, Paris, Singapore as well as domestic airports like Guwahati, Kolkata, Pune and Patna, among others. An airline spokesperson said Thursday that Jet Airways has “proactively cancelled long-haul west-bound departures from India till Friday morning”. Singapore’s Changi Airport said the airline has suspended its services to and from Singapore until further notice. According to industry sources, the airline is set to operate only five departures from Mumbai, one from Bengaluru and about 20 from Delhi on Friday. “Jet Airways flight 9W615 from Mumbai to Kolkata and 9W675 from Kolkata to Guwahati on April 12 are cancelled due to operational reasons. Similarly, 9W676 from Dehradun to Kolkata via Guwahati has also been cancelled until further notice,” Jet said in a statement. The cancellations, which come on top of an already curtailed schedule, follow grounding of aircraft. 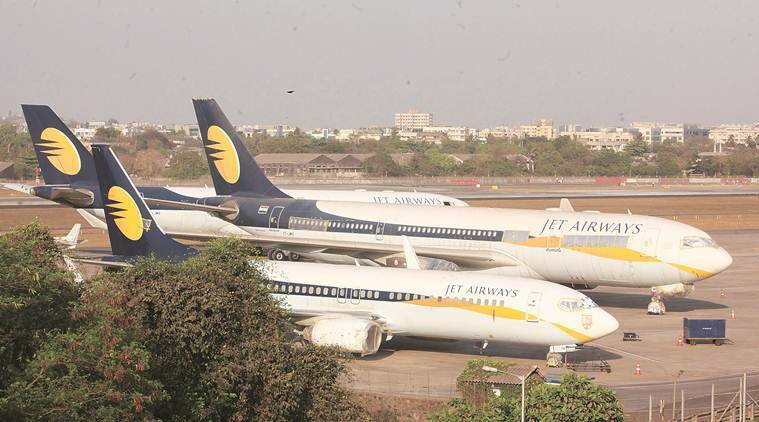 According to a senior official at the Directorate General of Civil Aviation (DGCA), Jet Airways is operating a fleet of 14 aircraft, against a full strength of 119 planes a few months ago. On Thursday, the airline informed the stock exchanges that it has grounded 10 aircraft on account of non-payment of dues to its lessors.